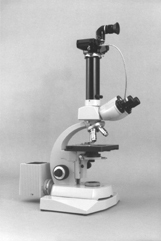 Diagnostic Instruments, Inc. was founded in 1967 by Angelo Merlo to develop scientific research instruments. 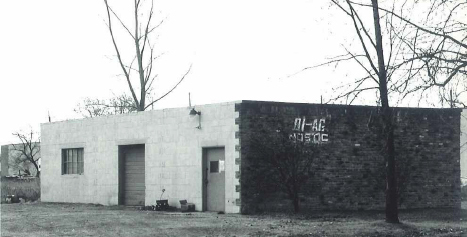 The first summer of the bootstrap company encompassed the construction of the corporate headquarters: a 1500 square foot structure that was built by hand by Angelo, his brothers, and their children in Sterling Heights, Michigan. Early research and development resulted in over 20 patents related to the novel use of microwave sensing technology, including the Microwave Combustion Analyzer and Belt Tension Audit System. Other projects included high resolution electrocardiograph systems for studying myocardial infarct recovery in heart attack patients, fetal heart monitoring systems, reaction time recording systems for substance abuse studies, agricultural seed planter monitors and valve seat inspection systems. Simultaneously, another part of the company began developing imaging components for the scientific and microscope market. 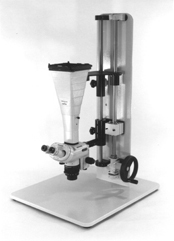 Early designs provided the microscope marketplace with imaging couplers for video and 35mm cameras, transmitted light illuminators, and various support stands. In 1990, Angelo Merlo retired and turned over the reins to three of his children, Patrick, Linda, and Philip. 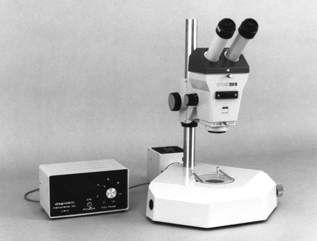 By 1993, the microscopy instrument group eclipsed the research/inspection instrument group and its resources were put toward the development of digital cameras for microscopy. 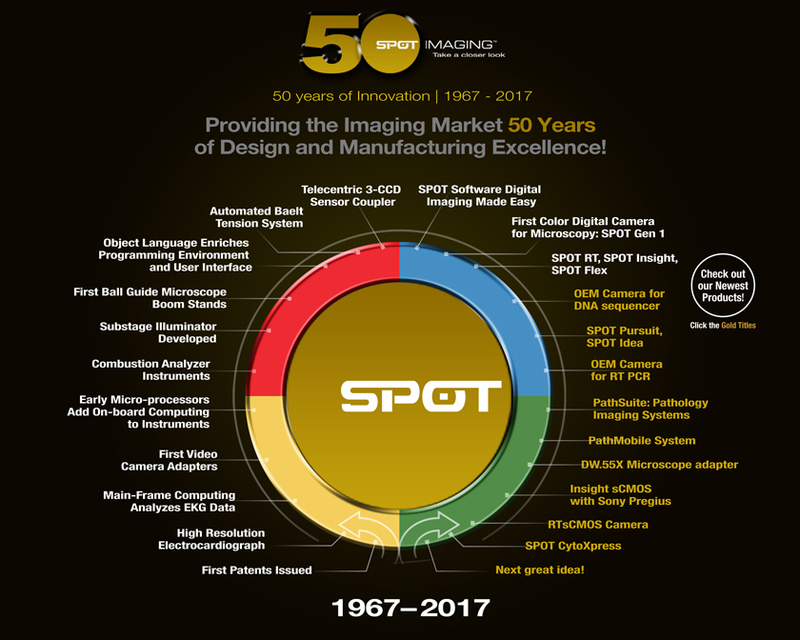 January 1997 heralded the introduction of the SPOT Color Digital Camera and SPOT Imaging Software, which was the first color digital camera designed specifically for microscopy. 1999 ushered in the SPOT RT Color Digital Camera, which included a novel Real Time preview window. 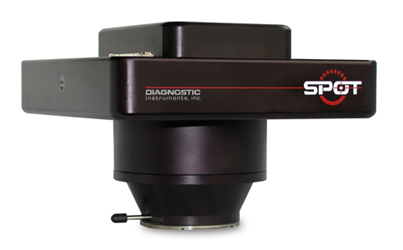 In 2000, the SPOT Insight camera was introduced, providing an everyday camera for routine brightfield microscopy. 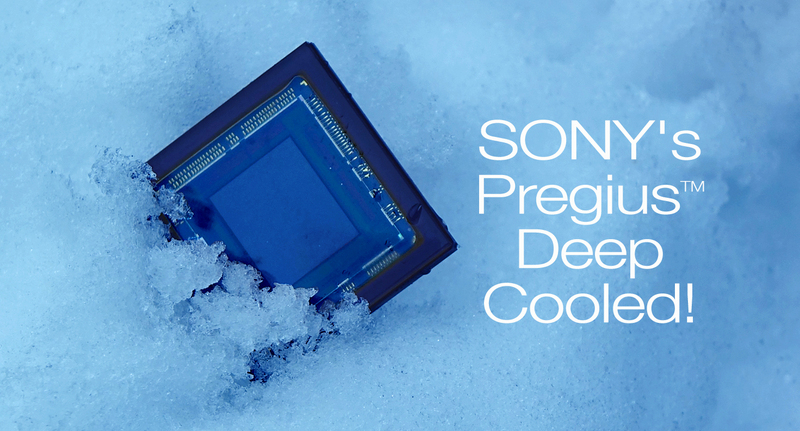 The global success of these cameras caused Diagnostic Instruments to grow and expand. A large, state-of-the-art addition was added to the original Michigan building to house the employees and manufacturing facility. In the new building, Diagnostic Instruments continued developing camera models to incorporate the latest imaging innovations, producing the SPOT Flex, SPOT Pursuit, SPOT Xplorer and SPOT Idea camera models. Diagnostic Instruments now manufactures a full product line of camera models and complete imaging systems for a wide variety of applications. To reflect this, the Diagnostic Instruments company name was changed to SPOT Imaging in 2008. SPOT Imaging continues to provide the biomedical research and clinical markets with the latest robust high performance imaging solutions to meet their demanding needs.